11.30. We cast off and motored out of harbour. 12.00. Wind SW 4/5. The sea state was moderate but reduced as we cleared the shore. 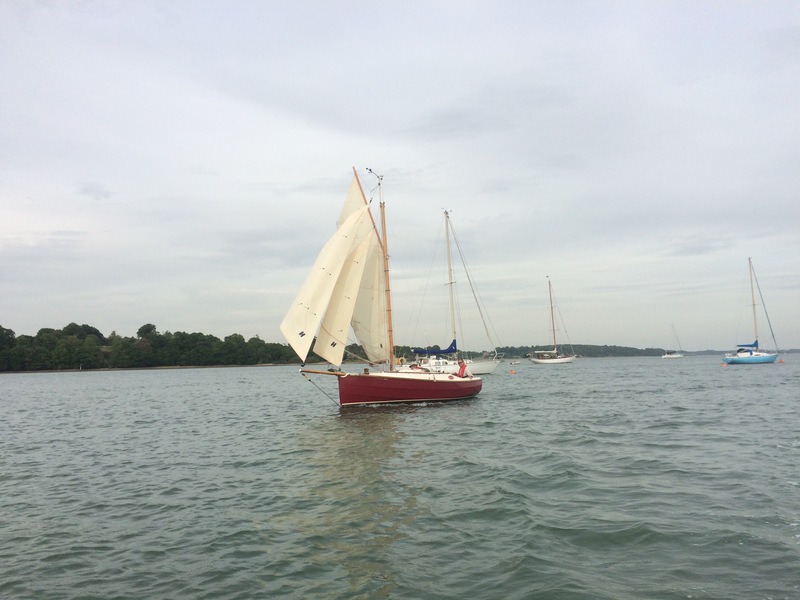 We raised one reef plus Yankee and sailed approximately 30 miles, then full sail for a couple of hours. 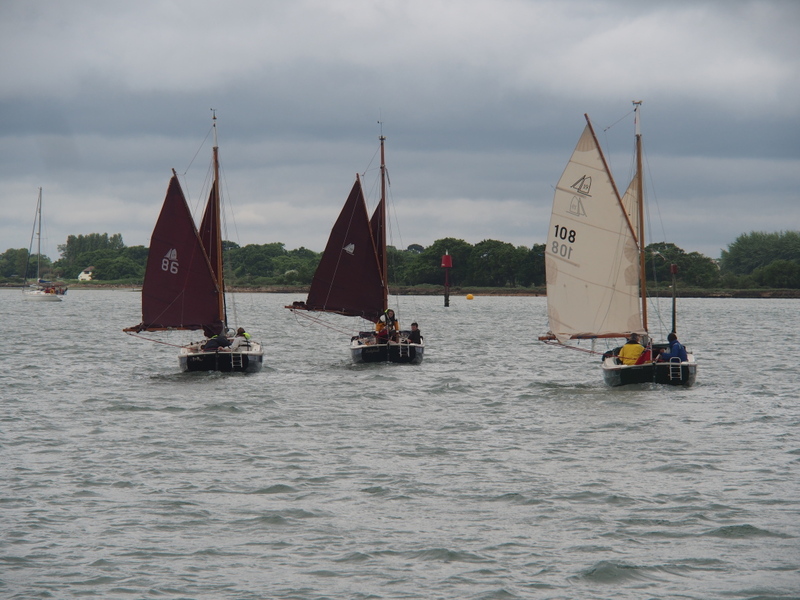 It was all going very nicely and proving to be a good days sailing. Then the wind backed S/SW, 3/4. We struggled to make the course for a while, so to keep on time and direction, we motor sailed. We were aiming for the tidal gate at Skomer and whilst sailing is fun, missing the tide has consequences, so thankyou Mr. Honda. self-steering rig using one of my many lengths of bungee. 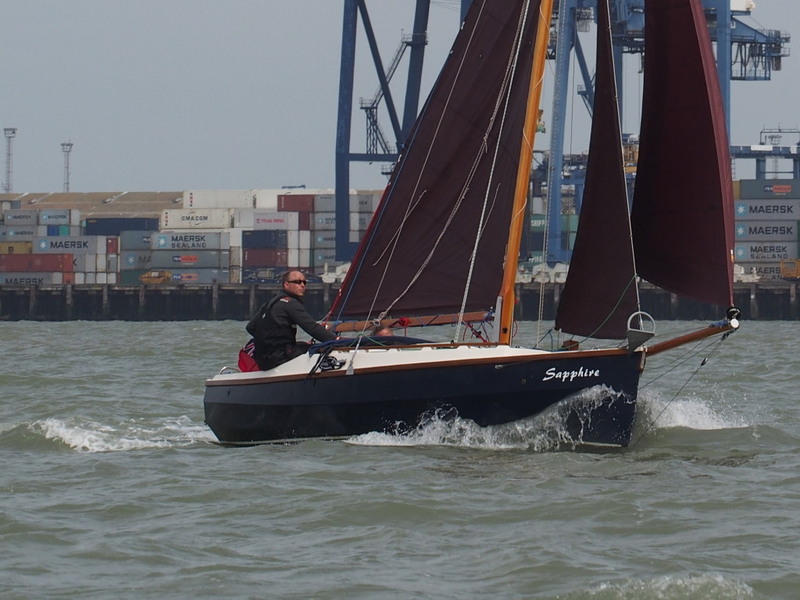 Close hauled, as we were most of the time, it worked well and could be left alone until there was a wind change or the sea state became too frisky. Once the wind was on the beam, and certainly once running the system was unreliable. A pod of 20 to 30 Dolphins joined us for about 30 mins mid passage and as darkness fell we could see what looked like a floating fairground approaching. The AIS said it was doing 8 knots and passing well in front of us .It turned out to be a drilling rig. The Fishguard to Rosslare Ferry was the only other boat we saw. We soon got into the routine of two hours on and two off as night set in. 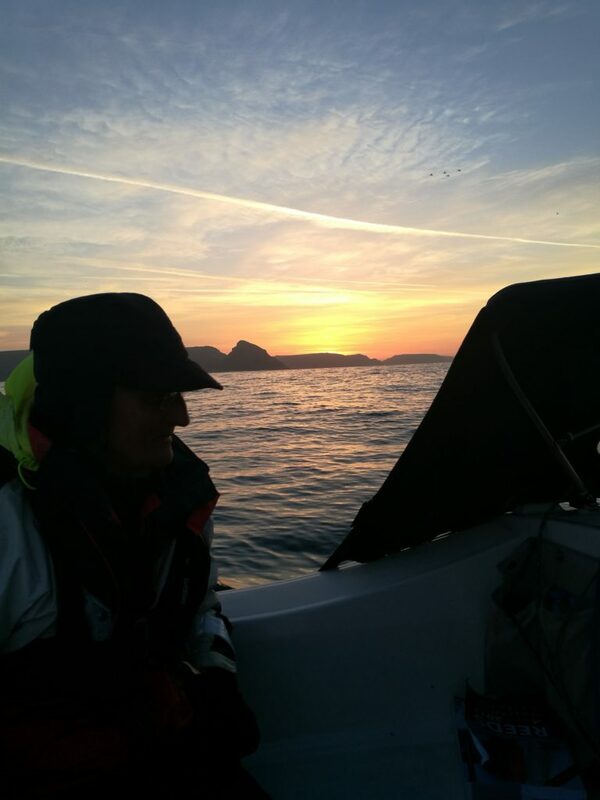 It was cold, but dry and we were blessed with a spectacular sunrise as we neared the Welsh coast. 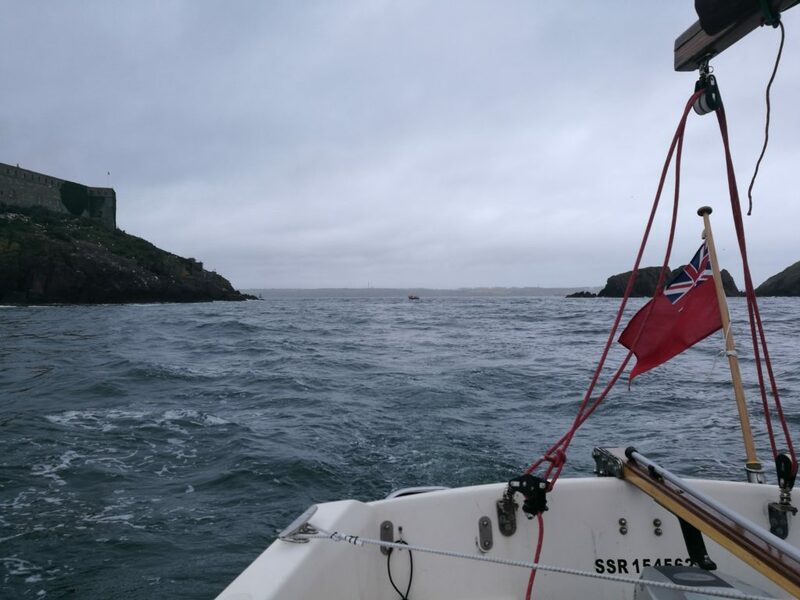 We passed south of Skomer in the Main Channel. There were loads of puffins, and with the wind dropping, we motored into the Haven via the Western Channel. The tide was fierce, but with some canny navigation and good timekeeping it was in our favour and not a problem (Mark was impressed). We thought of going into Dale, but the lack of facilities put us off. Looking west into Dale, the coast was bathed in sunshine. 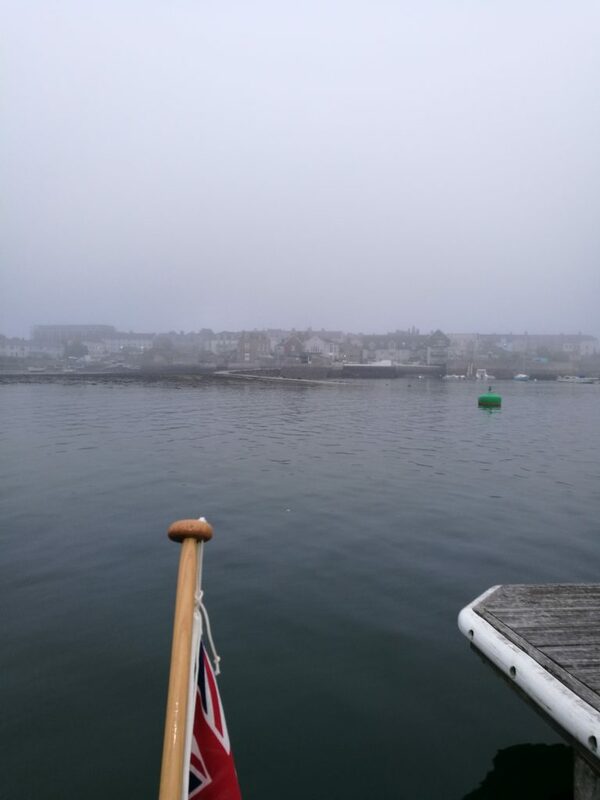 After turning east and heading the 2 miles or so into Milford Haven we hit a total fog bank. A real ‘pea souper’. We could hear on the radio that ships were asking harbour control if it was safe to move. We moved to the shallower and hopefully safer water on the north shore and inched east, aware there are multiple jetties projecting several hundred yards into the haven. Eventually we found one, towering above us. We couldn’t see it ahead, but there it was above. Funny thing fog, you can’t see forward but you can often see up. We crept around the perimeter and after an hour the fog started to clear. We found the marina entrance in clear bright sunshine and entered on free flow. 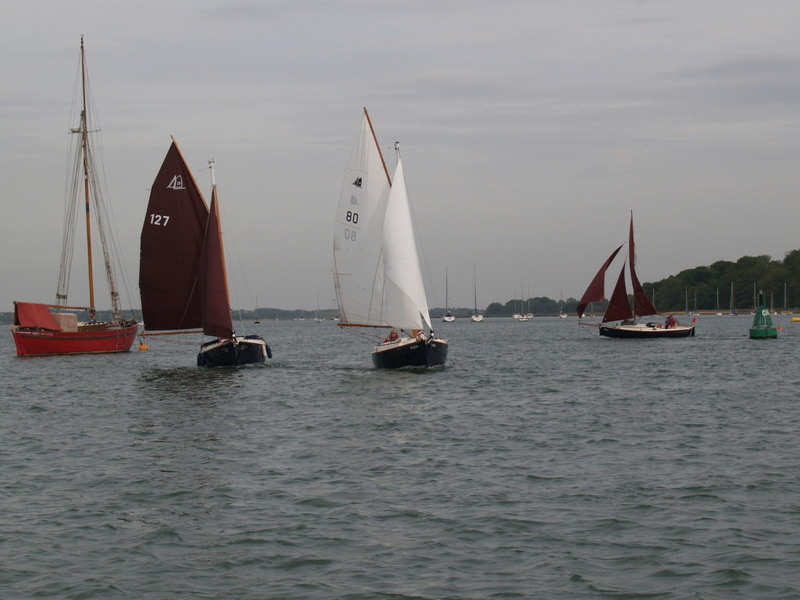 Our identity mistaken, we were directed by the HM into a flotilla of 30 Shrimpers on an annual bash. Not very satisfactory for us; they were rafting three deep and preparing for a day’s sailing. All we wanted was a quiet birth to crash out. After extracting ourselves from the flotilla, we found a suitable berth and moored up at 10.00. Being back in mainland Britain was a relief. In 10 days we needed to be somewhere accessible for a trailer, and as far east as we could get. Thursday we were storm bound. 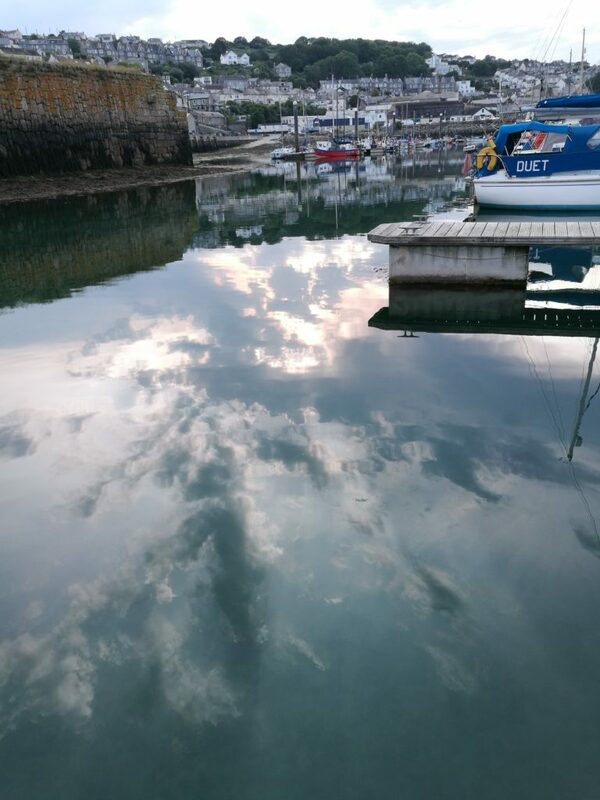 After several “what if” sessions we settled on Milford Haven to Padstow direct with Lundy Island as a not very attractive divert. A long but necessary leg. 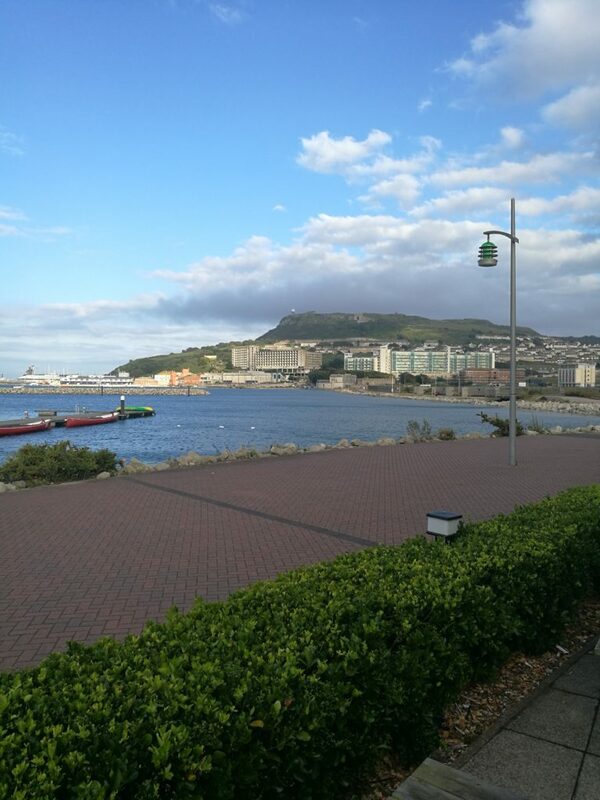 The forecast… ‘Midday Friday the sea state would be moderate but improving’. So that formed the outline plan. 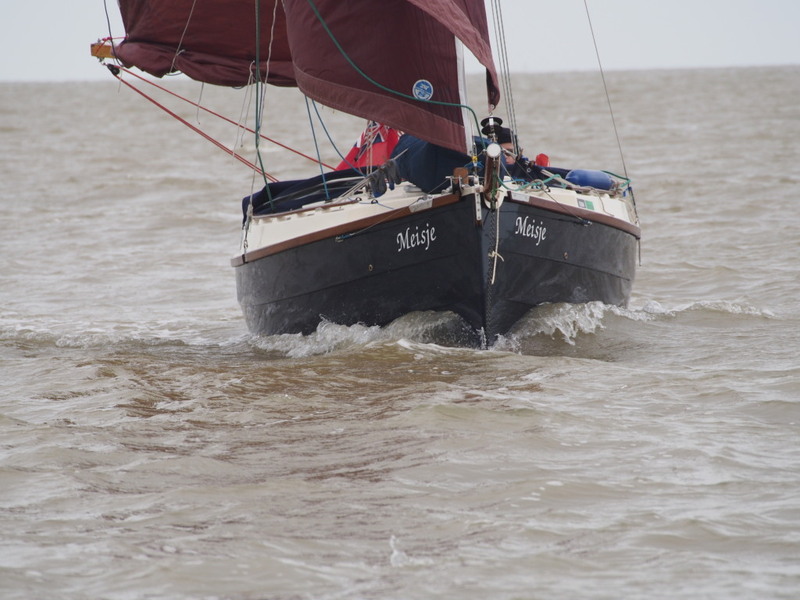 We were off across the Bristol Channel. Not before the ubiquitous brew and sarnies for sustenance. 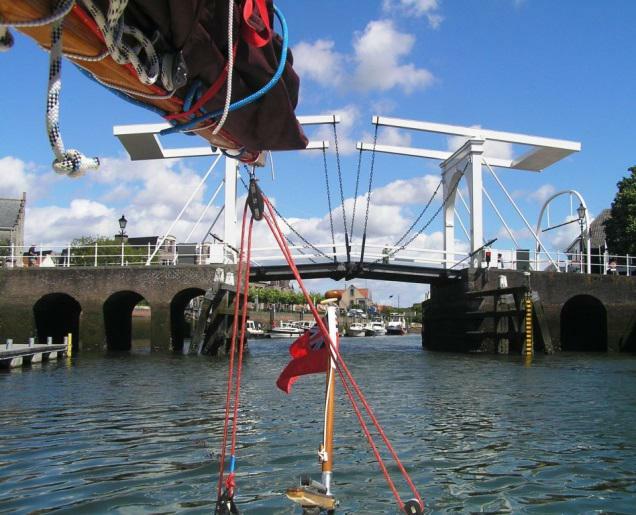 12.30 We exited marina lock and motored to the Haven entrance. 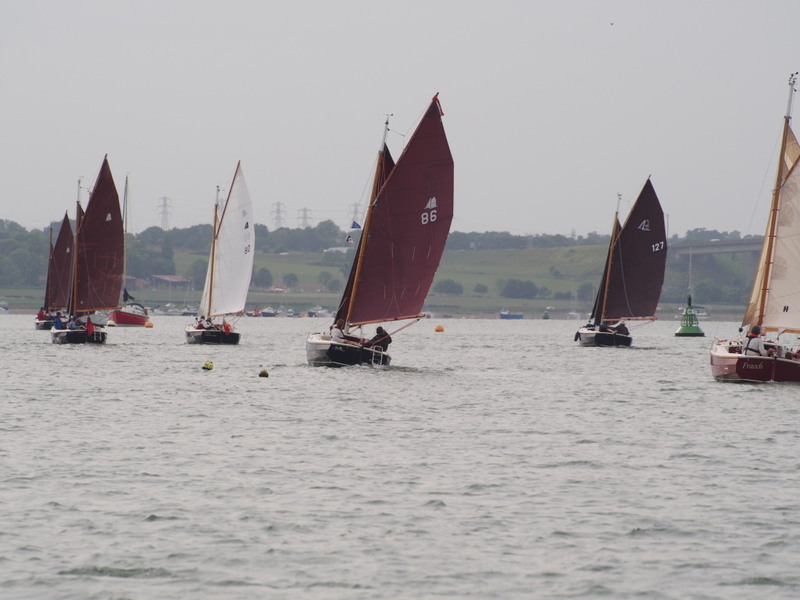 13.30 Set all sails and headed out. Close hauled and with a moderately lumpy sea we were making about 3 knots. After 7 hours the wind backed SSW, we progressively reduced sail to 2 reefs and staysail and motor sailed. 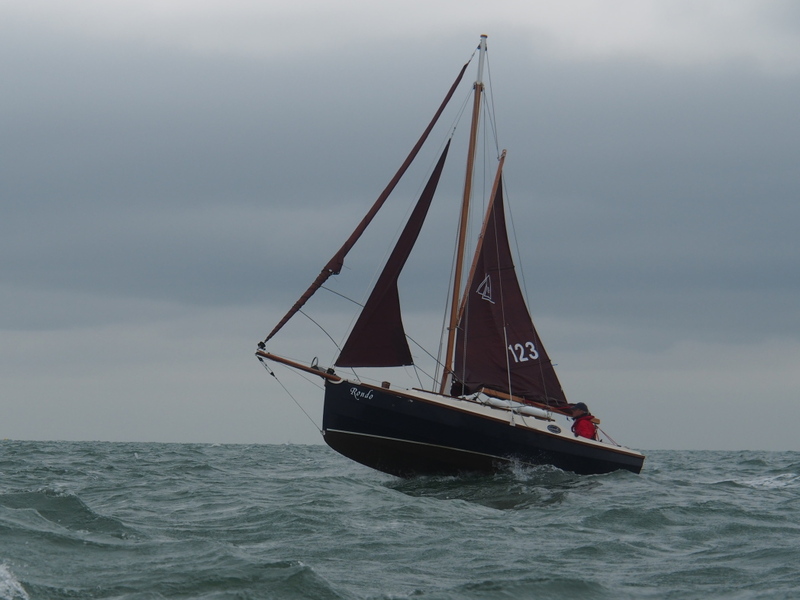 By 04.00 the wind was on the nose and we took down the sails and motored. We had a tide to catch. During the night we could see the lights on Lundy about 12 miles to the east. Although we were not that comfortable, we were not tempted to divert. The Yankee furler jammed and our intrepid foredeck, Mark, clipped on and went to fix it. After a couple of full head immersions in the pitching sea we got it clear. Sadly the dunking didn’t do much for Mark (I think he forgot to close his mouth). It took a quick chat with god over the side, copious amounts of lemon and ginger tea and several ginger nut biscuits before he recovered. We had several visits from small pods of dolphins. On Marks watch a group, clearly a family pod with a juvenile, came over to say hello. The youngster popped up and down erratically as it raced to keep up. Mark said he chatted with them for about 20 minutes as they scooted alongside close enough to touch. They always cheer you up. I was on watch for another fantastic sun rise. I was tempted to wake mark, but figured that after the nights dunking he probably needed his rest more. 08.00. 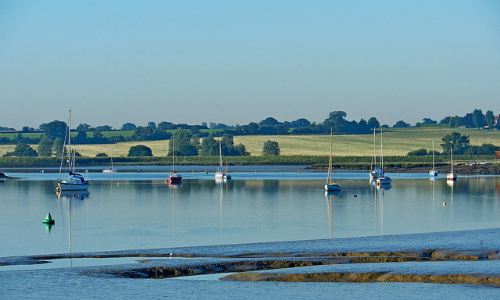 We entered the estuary, passing Doom Bar with blue sky and a warming sun. 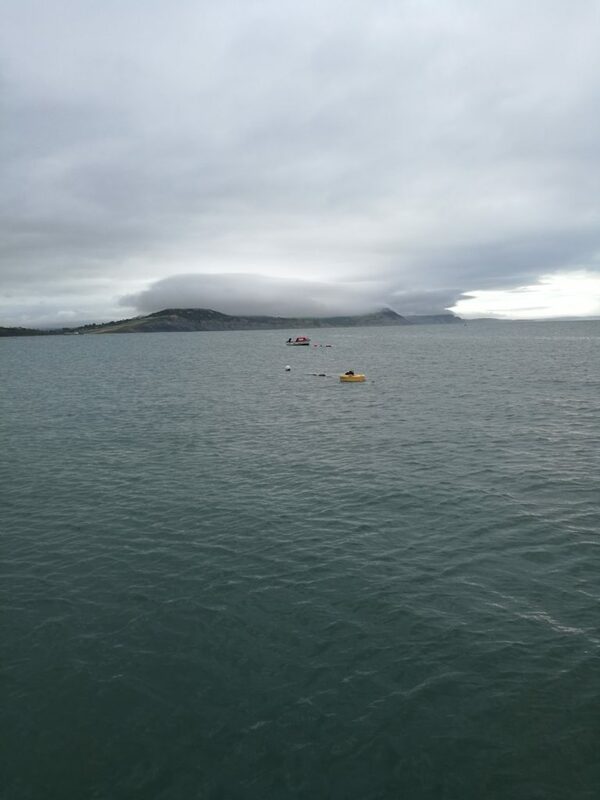 We motored to the pool, found a buoy and moored to it at 09.00. I Phoned the HM, to confirm the gate would open at 10.00. Sleep for an hour or so, then into the inner harbour. 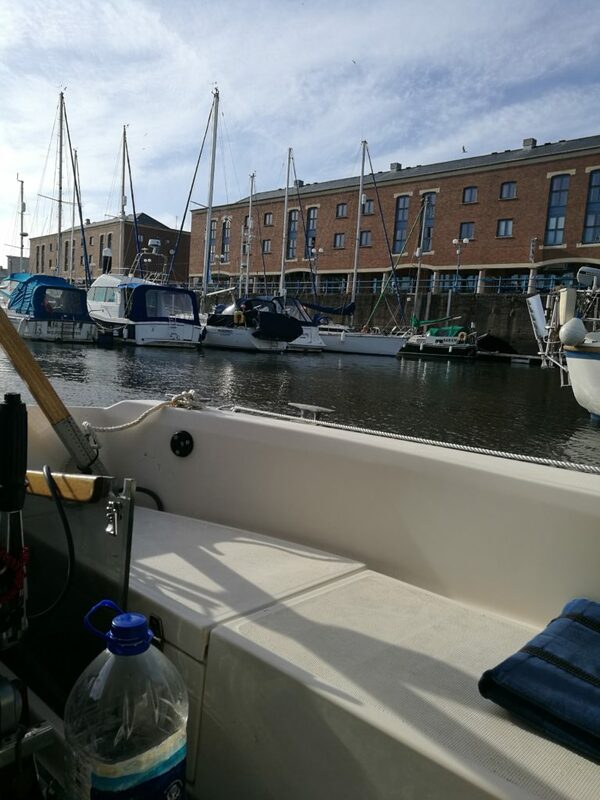 Initially it looked as though we would be on the wall, or rafted up, but we spotted a tiny berth between two motor boats on the pontoon, just right for Minnie with the bow sprit lifted…luxury. Best room in town. 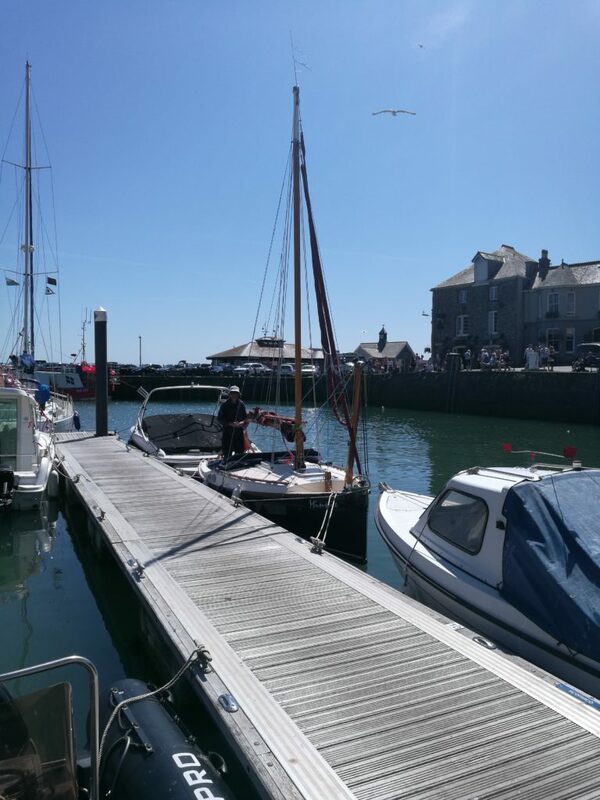 The harbour is very small, the gates are opened 2/3 hours per tide, but the HM is very helpful and once in you can be thankful you’ve arrived by boat and not driven, or indeed tried to walk in a straight line as the town was packed. The HM sorted us out with 13 litres of petrol, we showered, had an excellent lunch at ‘No 6’, a Michelin Starred restaurant, and slept. 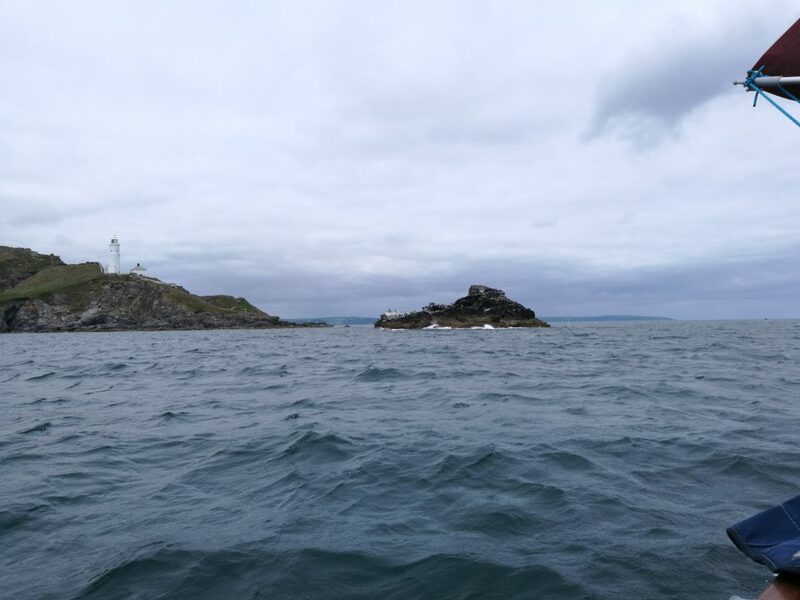 A forecast check suggested we would be ok anchoring in St. Ives bay, well positioned to pass Land’s End the following day. No early start as the gates didn’t open until 11.00. So we loaded up with Cornish Pasties. Local knowledge tip, the bakers on the front is not the best, Rick Stein’s Deli is the place to go. So we did and they were great. 11.00 Left harbour with several other yachts. 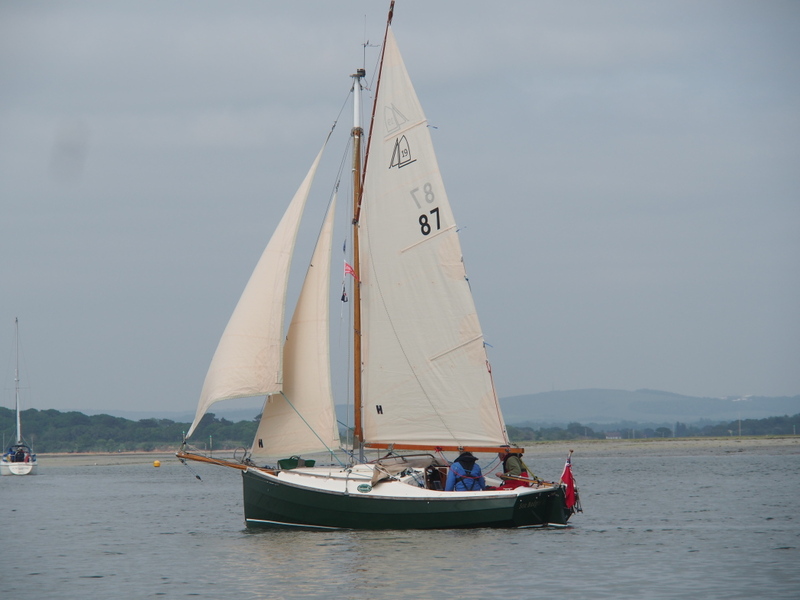 Caught the South going tide and had a gentle day of sailing and motor/sailing with fluky winds all day. 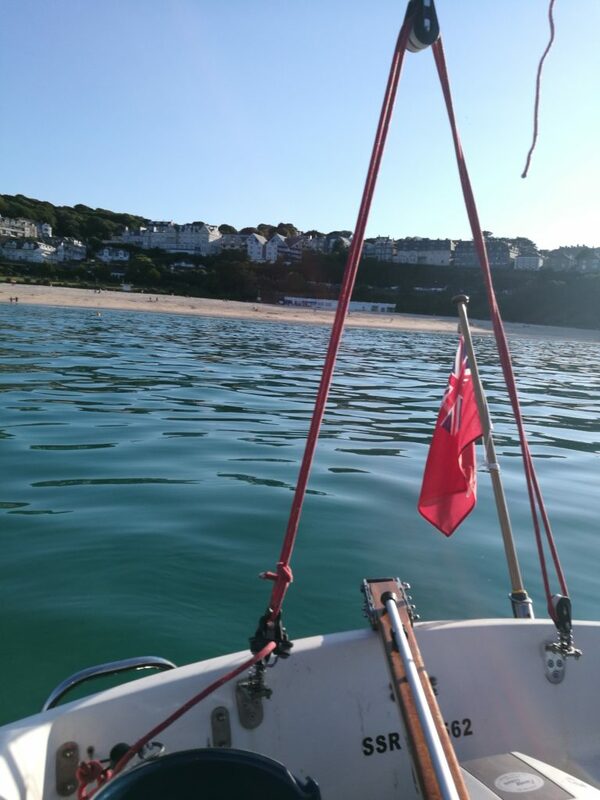 19.00 Had a look into St. Ives harbour, dried out, and decided to anchor off the beach in amongst the moorings. We thought about getting the dinghy out… but too hard. Mark offered to swim ashore and get some fish and chips, but I couldn’t afford to lose the crew! So it was a can of beer and a ‘three tin’ luxury stew (chicken, sweet corn and potatoes). Checked the anchor alarm, had another beer and watched the sun go down. Life’s hard. 06.00 Left anchorage, what a sunrise (fortunately this was to become a feature of the trip along the south eastern coast). 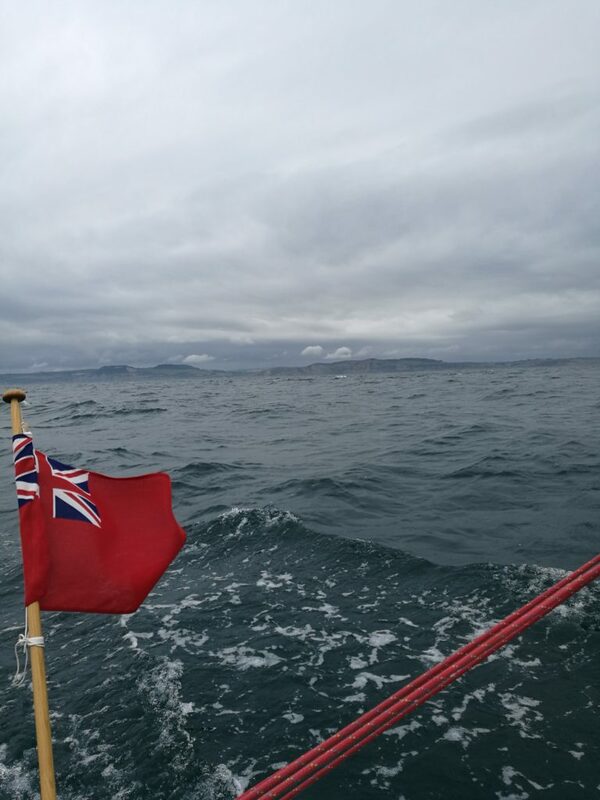 Mixed sail, then motor sailed to Longships with a very smooth sea state. Land’s End was pretty uneventful, but good sailing with full sail and a nice breeze. We even had to don the hats for sun protection. 10.00 We sailed for several hours. 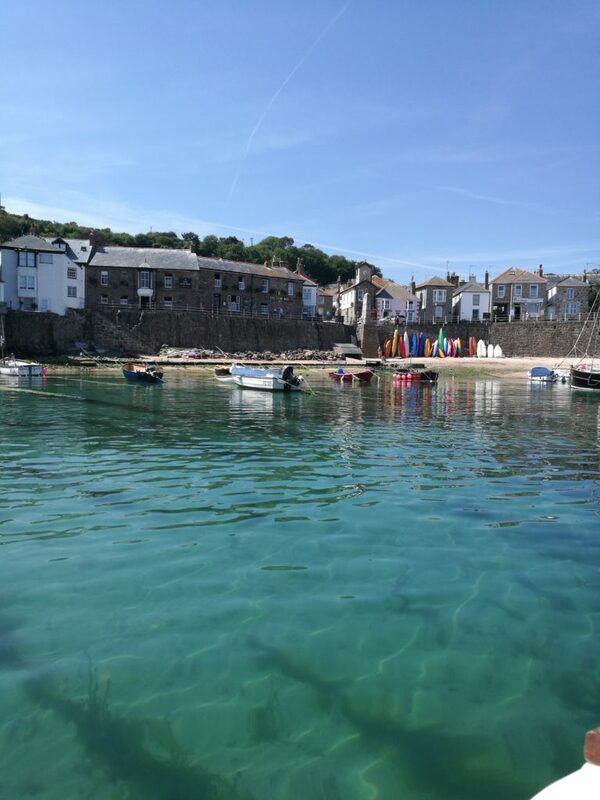 Eventually we dropped the sails and motored into Mousehole. 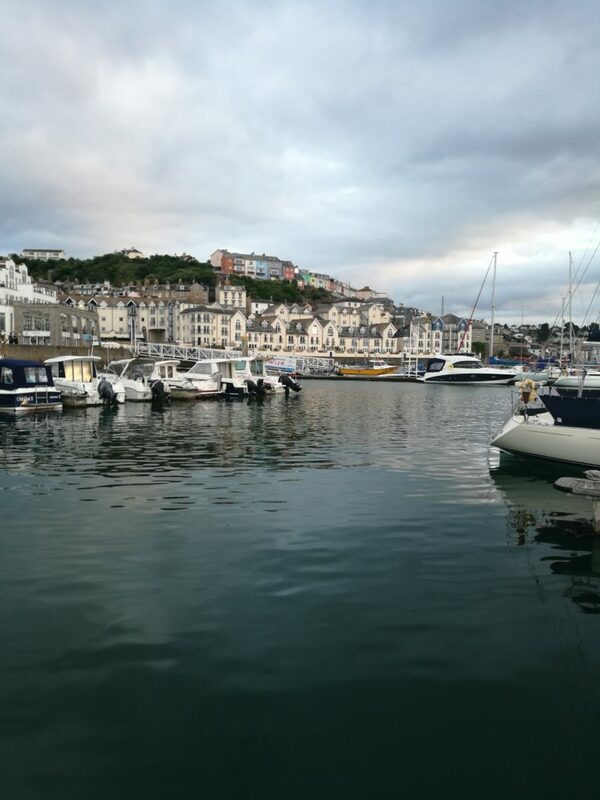 It’s a tiny harbour and not a great place for visitors mooring, but picture postcard pretty. So on to Newlyn, which seemed a better option than Penzance across the bay. 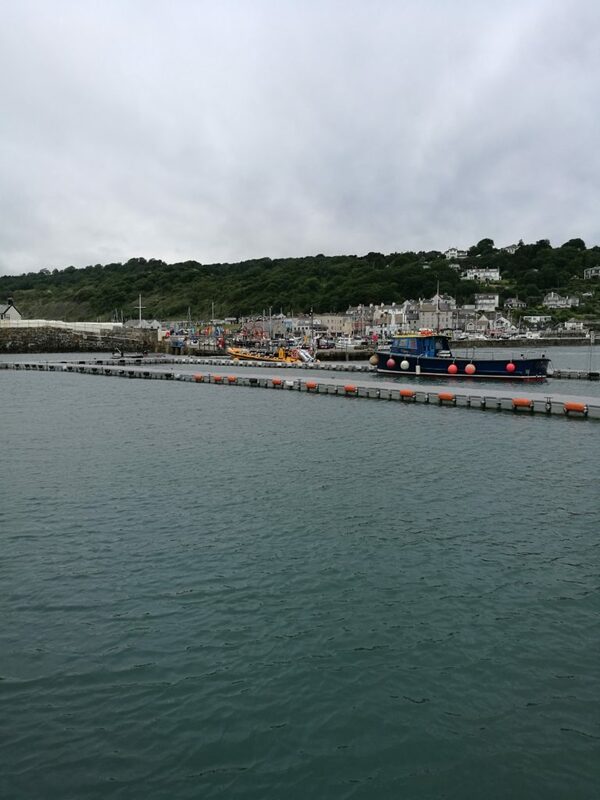 Newlyn is a busy fishing port, open all states of the tide and with a growing number of pontoons available to yachts. More suited as a stopover than as a destination. The staff are helpful, friendly and slightly chaotic .The toilet / shower block (I use the term loosely) is a 1950’s ‘brick khasi’. Freezing cold, with a concrete floor and an electric shower. The key is held by the night watchman. Shivering, stripped and ready to shower, I put my £1 coin into the slot to find that new £1 coins didn’t work (school boy error). A spell of ranting and raving helped to warm me up. Eventually I got my shower. The supermarket is nearby, and petrol about half a mile away, 11 litres filled us up. Mark, on the other hand had, whilst I was away, befriended some Dutch sailors on the opposite boat. He had gleaned the ‘old pound trick’ information whilst sharing a glass of wine and chewing the cud. A pastime he’d mastered from the Irish venture. 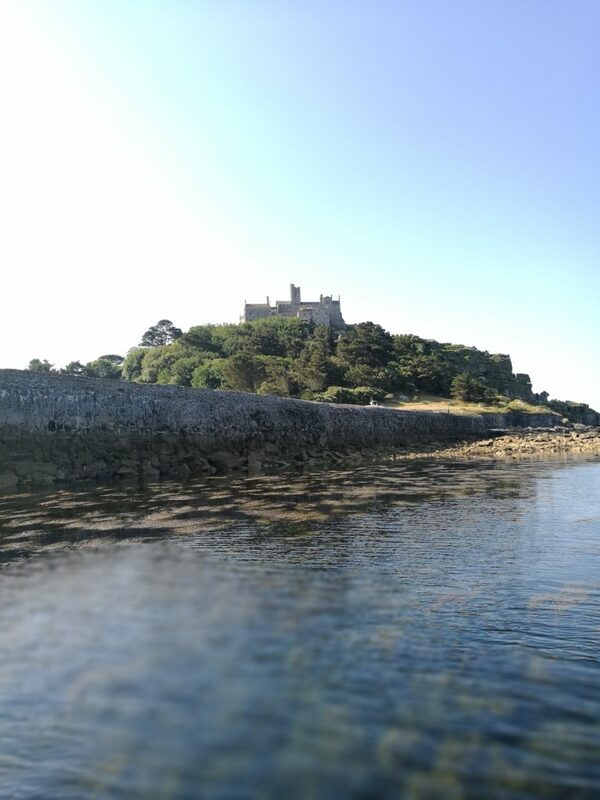 0800 Departed under engine and motored to St. Michaels Mount for photo opportunities. 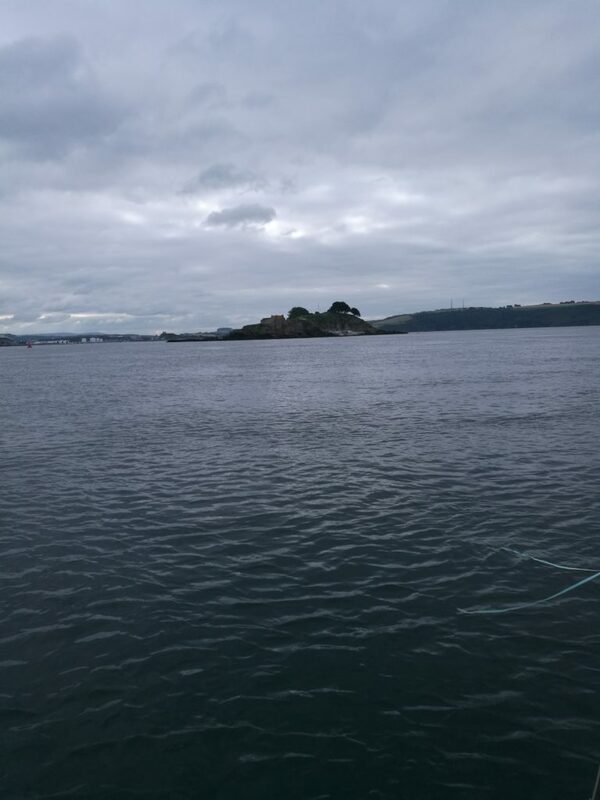 Motored into the small harbour, looked around and then set sail for Lizard Point. Sailed near to the point before finally being headed by F5 wind. 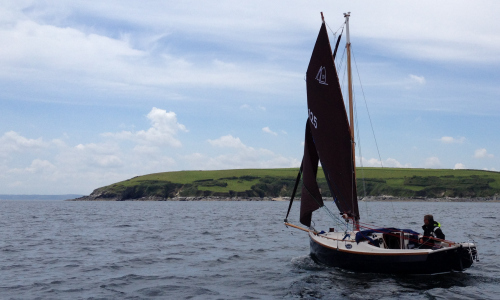 We dropped sails and motored around the point before sailing to Falmouth Haven Marina. 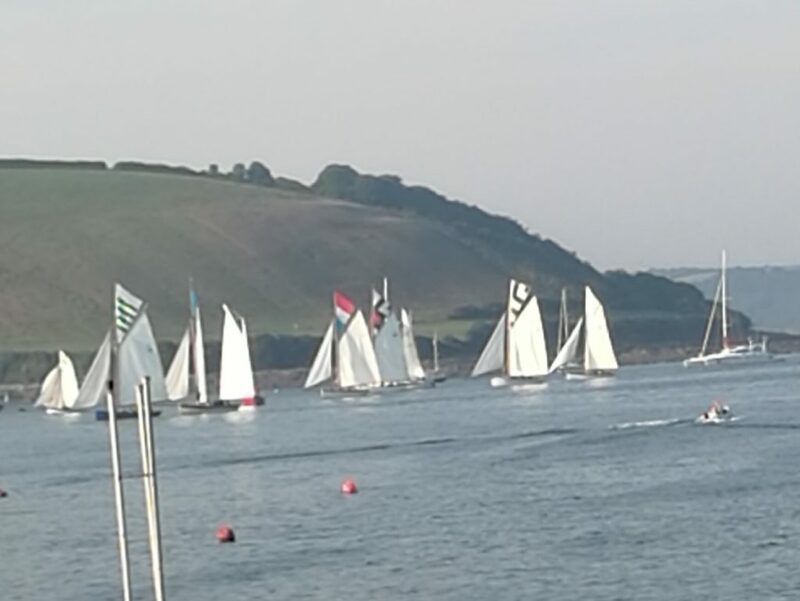 A few dolphins, many puffins, and in the harbour a gaffer race of 20 or so yachts racing complete with multi coloured topsails. Not a bad days sailing. The marina was packed, with much rafting, but we found Minnie a 6 metre space behind a 40 ft. and very wide catamaran. A tricky manoeuvre watched by several skippers, arms folded, waiting for a mishap. No bother, we slipped in with true CC19 style …always room for a little’un. 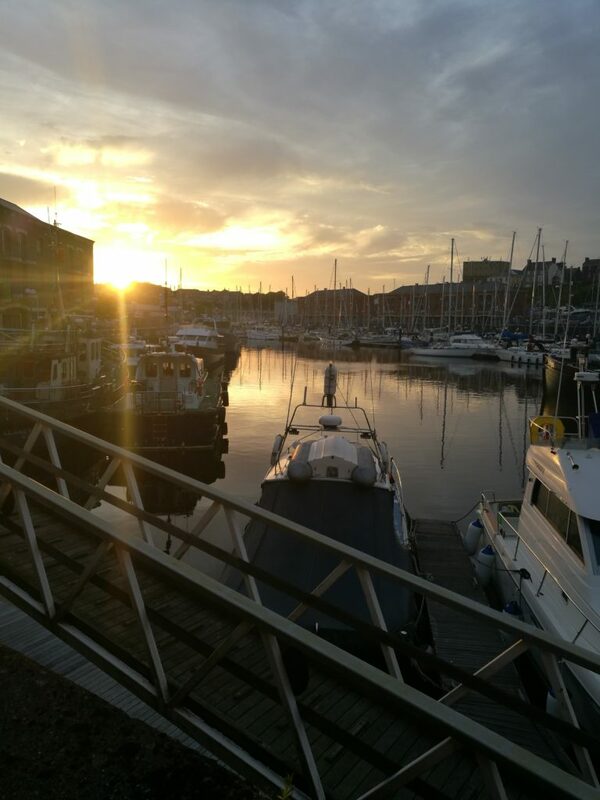 The marina is close to the town centre. So a quick walk around, 6 litres of fuel, some groceries, a couple of pints and we were ready to go. 0700 Motored out and by 0800 we had raised full sails. Sailed until 1400 when the wind died. Motored to Mayflower Marina arriving at 1730. Just as the mist started to fall. A Huge marina, with huge boats. We moored next to an enormous sailing cat, 65ft I think. It was brand new and the owner was delighted to show us around. Two double cabins with unsuits, two further cabins. The centre deck was a kitchen, diner, and lounge area. Twin engines, power controls on all sheets. 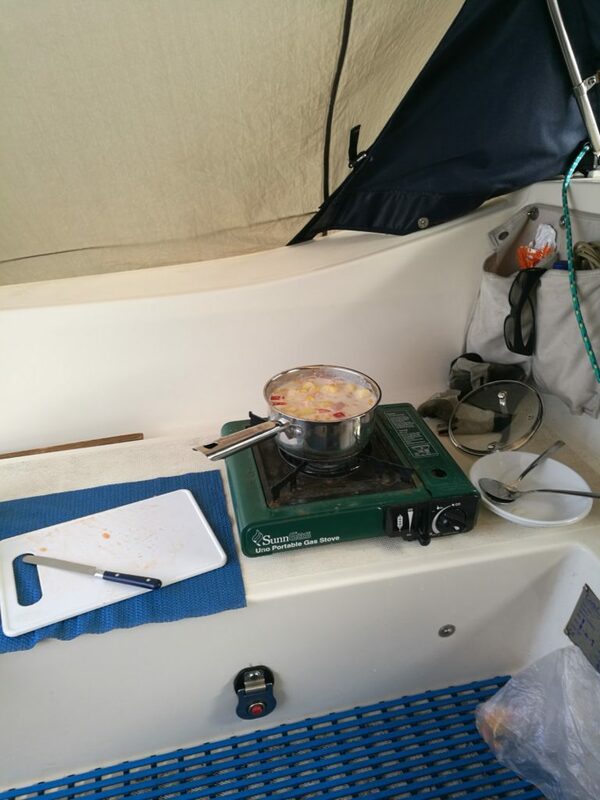 No need to stray outside the cabin….in fact with the radio controls and cctv you could probably stay at home and the boat would sail round the world by itself. It did look great and I’m sure you could have a lot of fun….plus, his girlfriend liked it. Not quite the same as Minnie who bizarrely turned more heads in every port we entered. You can’t beat a small but perfectly formed Gaff Cutter. Although the extra comfort would be nice. A walk to town, 10 litres of petrol. Good to go. 0800 Motored out and raised sail. Wind F3/5 Westerly all day. 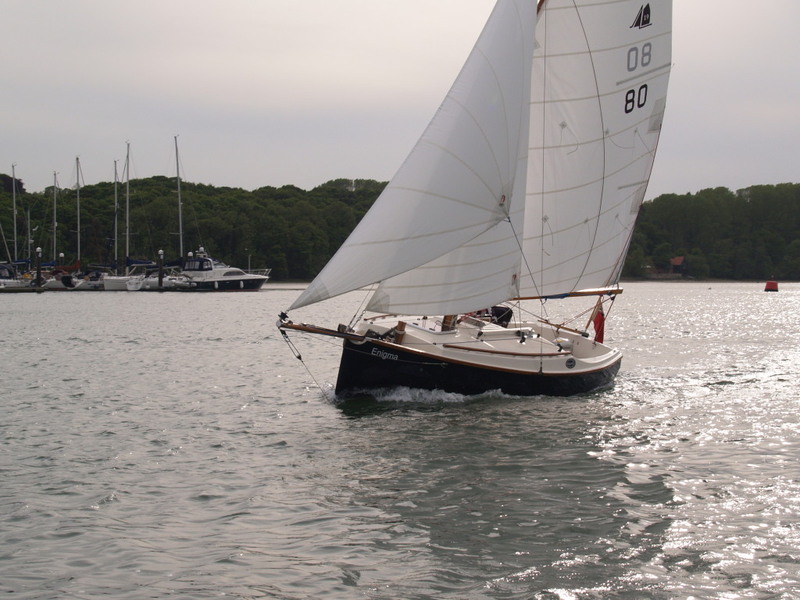 With no genoa on board we tried many configurations to maximise speed. 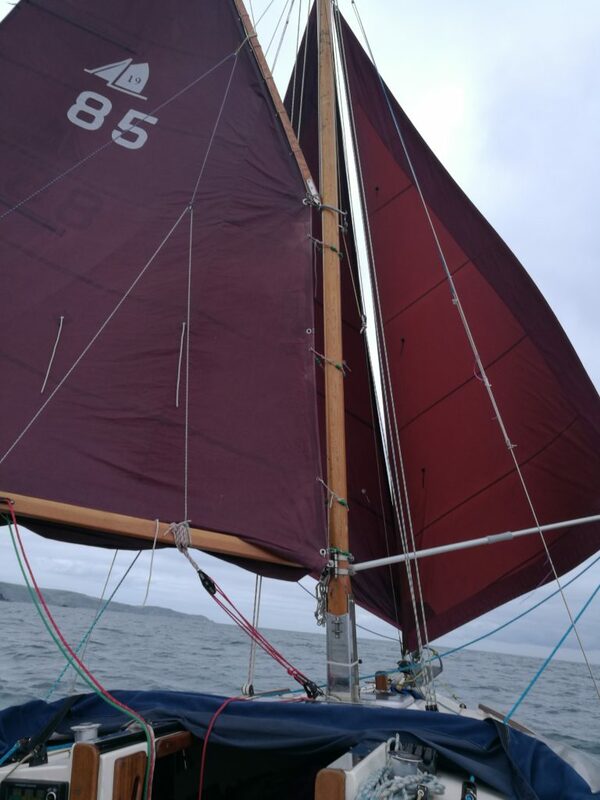 Generally the main was pinned using the preventer whilst we poled out the Yankee or staysail. Finally we tried poling both out, on the same side, then different sides. Looked a “dog’s dinner”, but all good fun and seamed to speed progress. We passed Start point at 1500. Best sailing of the trip, four hours of 6 knots plus, best speed 7.7knots (with a bit of tide support). 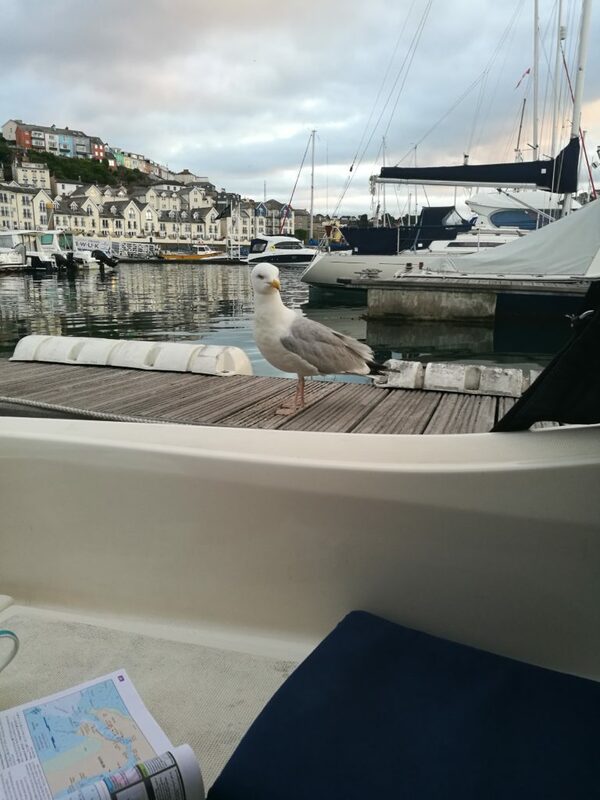 We arrived in Brixham Marina at 1800. 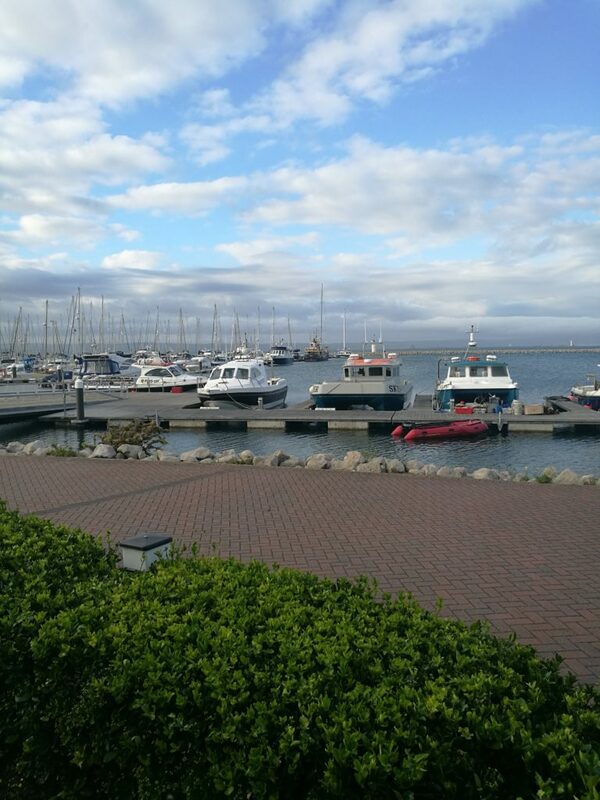 A good marina, close to town, and a good fish restaurant. Clearly someone was feeding the Gulls. This one would have been in and scavenged the supplies if opportunity allowed. 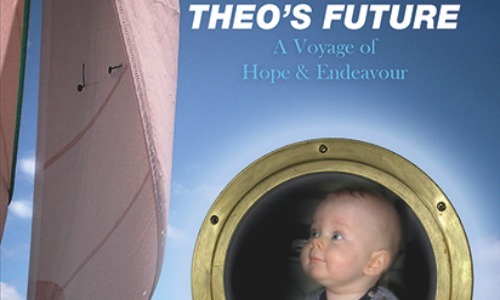 Talking to my son, pick up was arranged for the 25th, so we started planning to get to Portland or Weymouth. 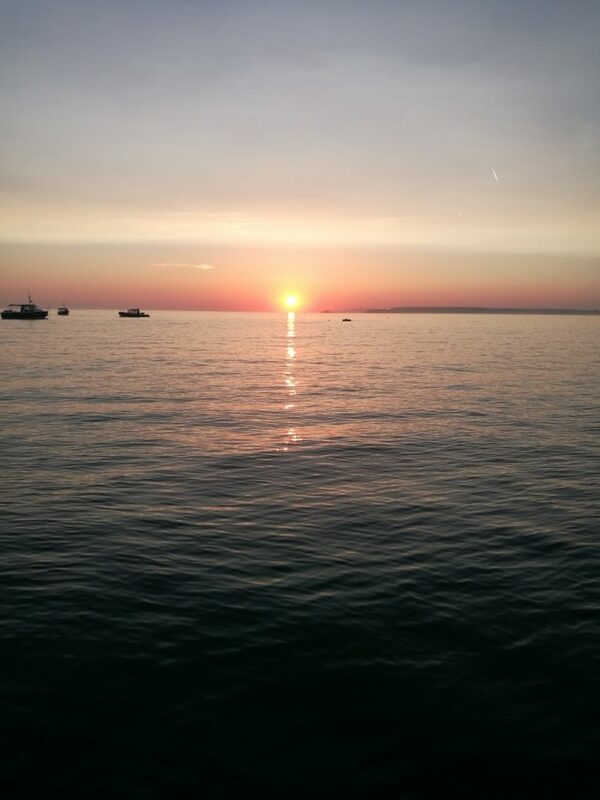 The next night we needed to be in West Bay or Lyme Regis…picked Lyme Regis. 0845 departed, wind westerly F4/5. 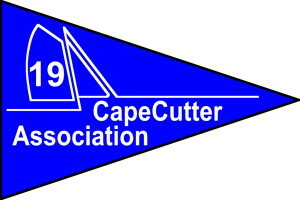 Set one reef and both headsails. Run to broad reach all day, max speed 7.1 knots, average 4 knots. Lyme Regis harbour was sheltered from the westerly winds, which was increasing as we arrived. 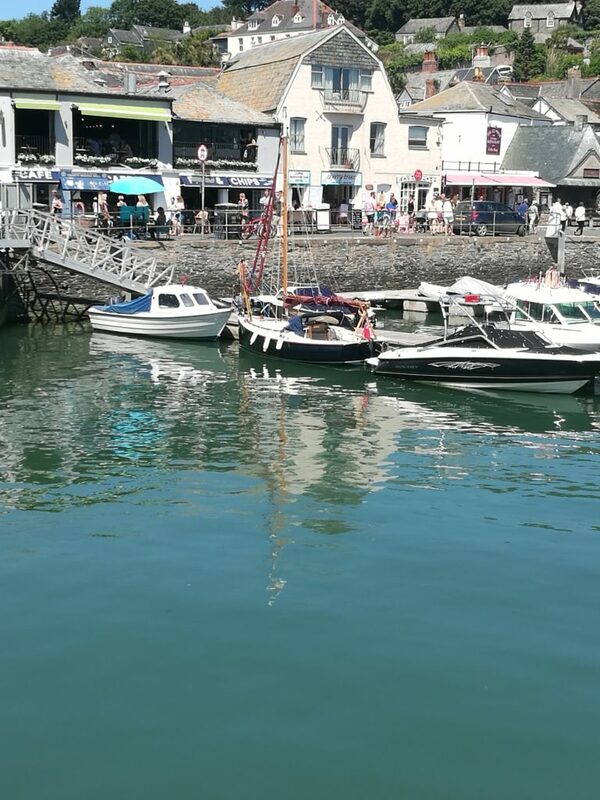 The harbour is mainly drying, and packed with local crafts. There was however an area of plastic floating pontoons outside the inner harbour, rather like a large floating Lego kit. As it was tucked behind the sea wall we moored alongside several other boats, had a one pot wander and settled in. With the wind probably F6/7, we spent a rather uncomfortable night, albeit secure enough. In the morning we showered in the sailing club. The HM office was helpful and friendly. Lyme Regis is a pretty little town, plenty of 1950’s holiday resort character. Even though the weather wasn’t the best, the beach was still full with families having a great British time of it. A good café on the front, so we forced ourselves to have more splendid bacon and egg rolls with fresh coffee before we set off. Planning for Portland Bill went as follows…we needed to be at the Bill by 1700 to allow a tide assisted pass via the inside route . L.R. to the bill is 22miles, i.e. 5.5 hours at 4 knots, allow an extra hour for “events”. 1030 Departed, 2 reefs plus two head sails. 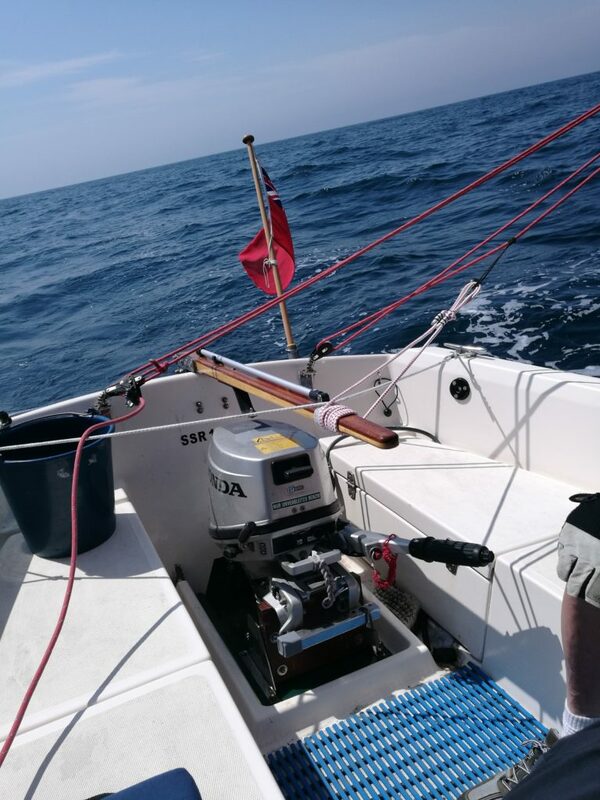 The wind slighted so at 1230 we hoisted full main, speed 4-5 knots 1400 one reef in. 1500. 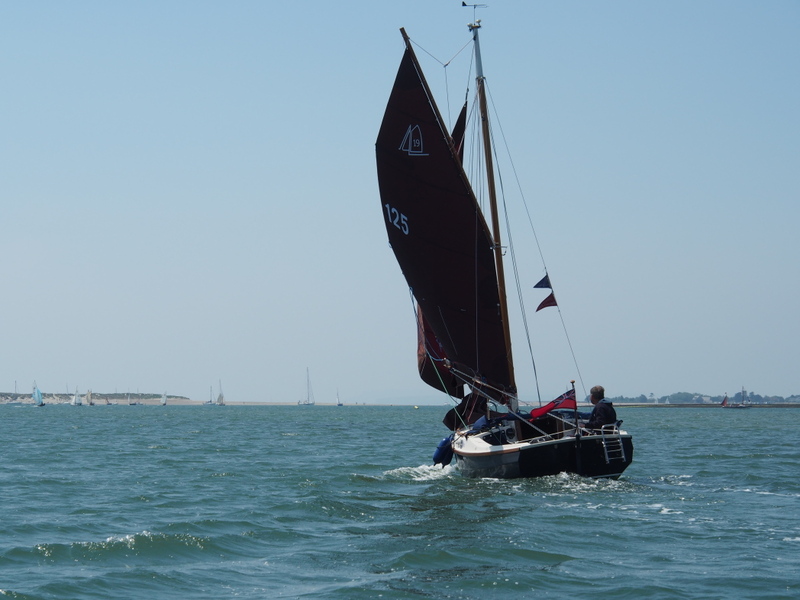 2 reefs and staysail, still doing 4 to 5 knots, so we tacked and practised “heaving to” in order to delay. It was dark and dank and a drizzle had started. 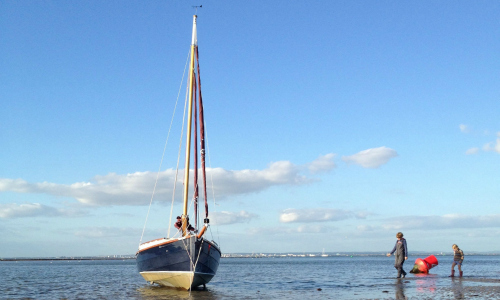 It was tense, but we were determined to make it round under sail. At 1600 we were close to the Bill. It was misty and blustery and we tacked several times to waste time before approaching the turn at 1700. This gave the right conditions of tide and current to get carried around without being fired out by the opposite flow, which would have been pushing out from the other side. 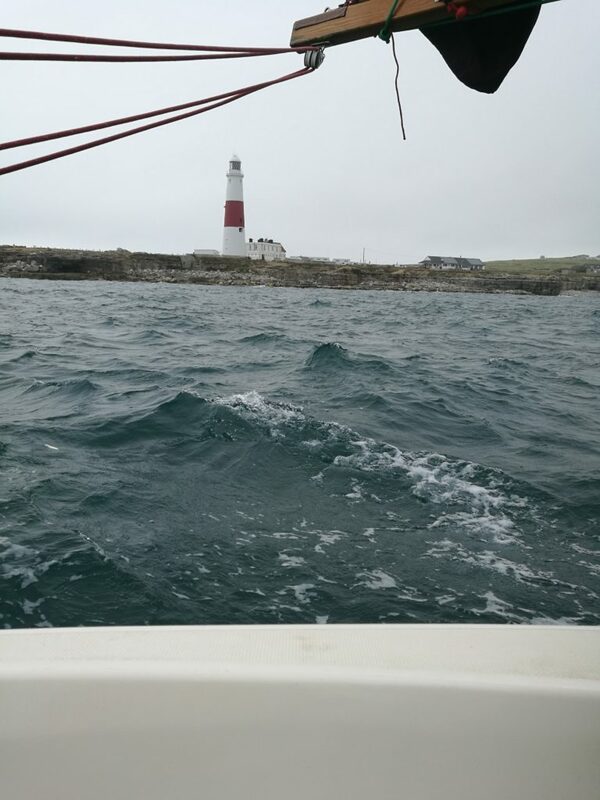 It’s great when a plan goes right and we rounded Portland Bill, close in, and under sail. 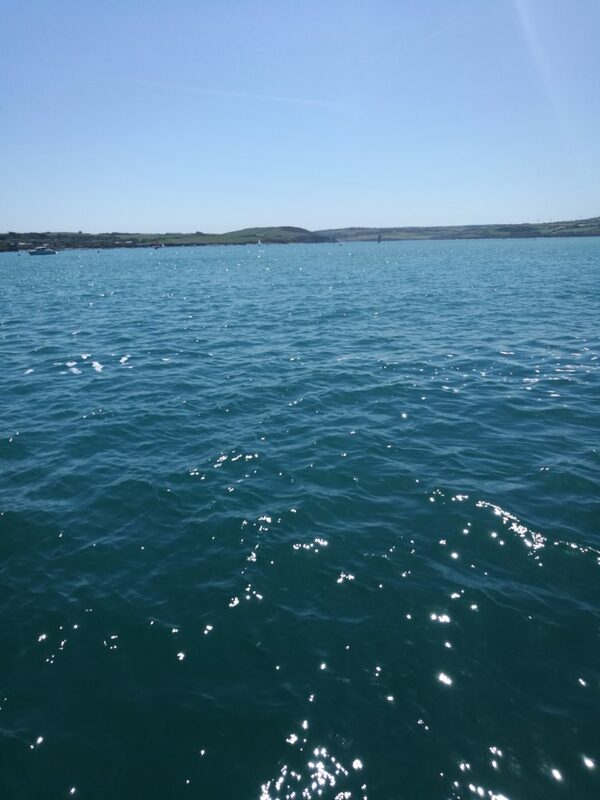 The sea state calmed and the wind reduced as we ran down to Portland harbour. We had difficulty contacting the Harbour Office, eventually getting through using a hand held VHF. At 1800 we moored in the marina. Excellent facilities, although a bit empty and remote from the town. Fortunately there are a couple of bars and restaurants on site. So we had a final meal and prepared for lifting out. 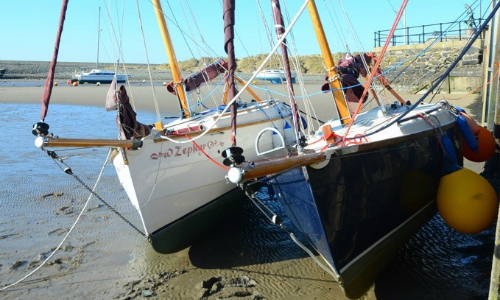 The following morning transport arrived and we hauled out Minnie on the sailing club slipway, packed up and headed home. In total we travelled 600 miles across five nations (if you treat Northern Ireland as a separate entity). We used 106 litres of fuel. 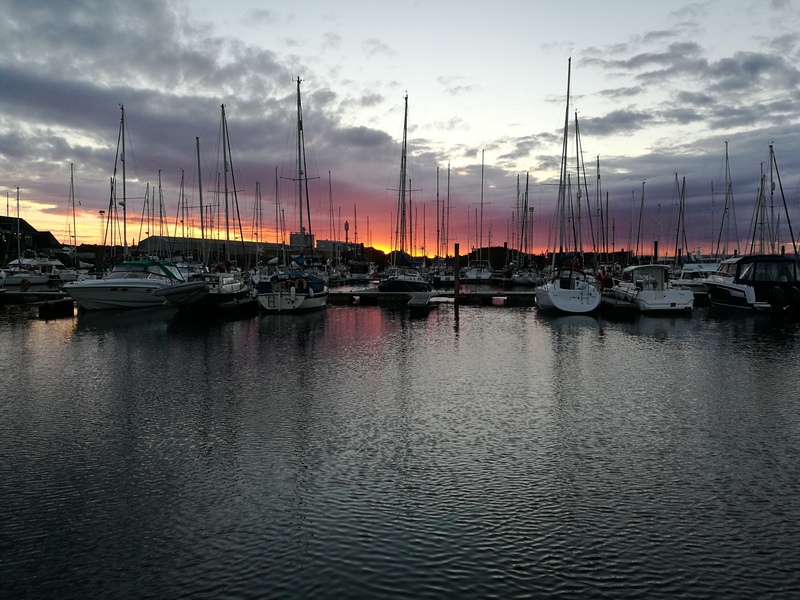 Had 16 days sailing, 4 days huddled in port, and 7 days with adverse winds. 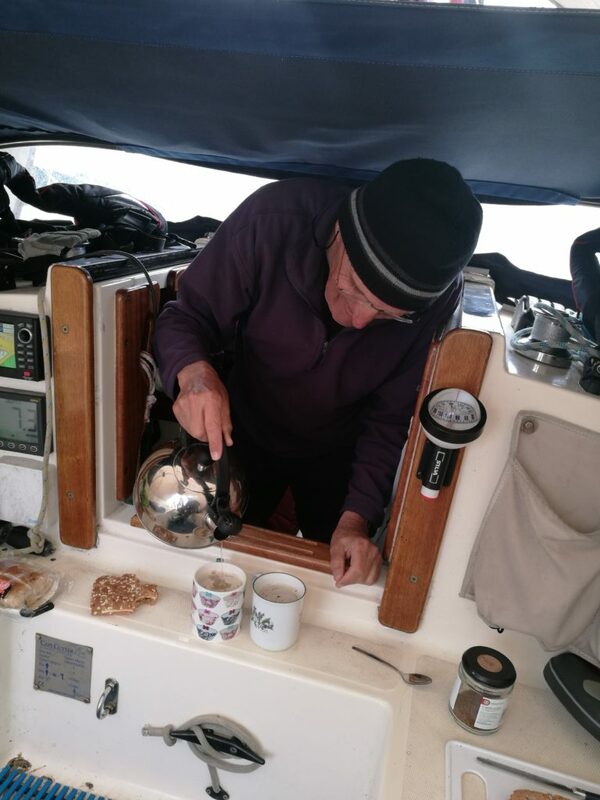 We had several gallons of tea, many splendid meals both on board and ashore. Another successful leg on the Minnie’s circumnavigation of the United Kingdom. 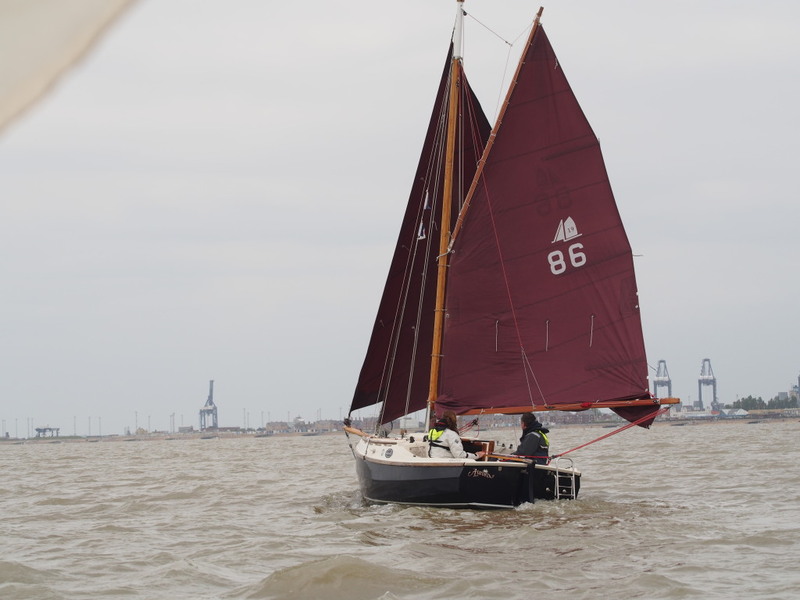 Plan ‘A’ is to complete the Round Britain Trip, with Mark, hopefully ending up in Harwich. 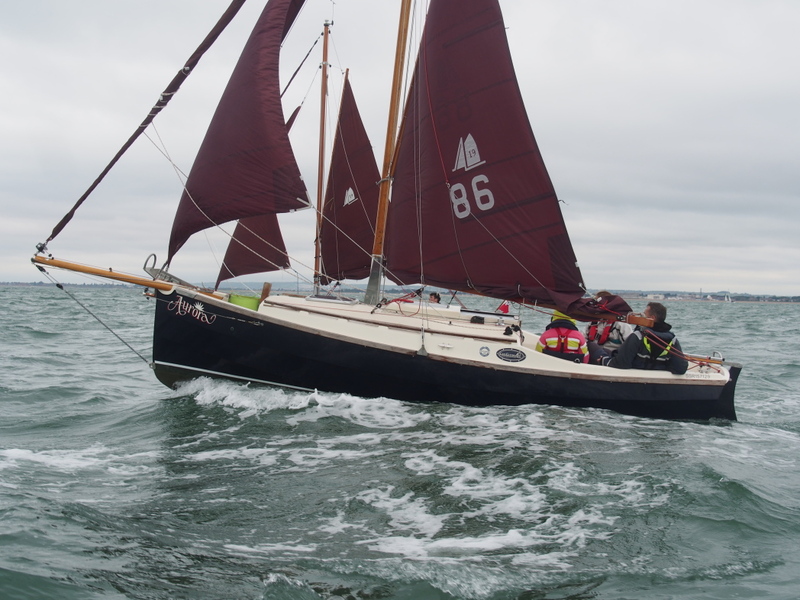 Plan ‘B’ is to take in the Round the Island Race on Sat. 7th July. 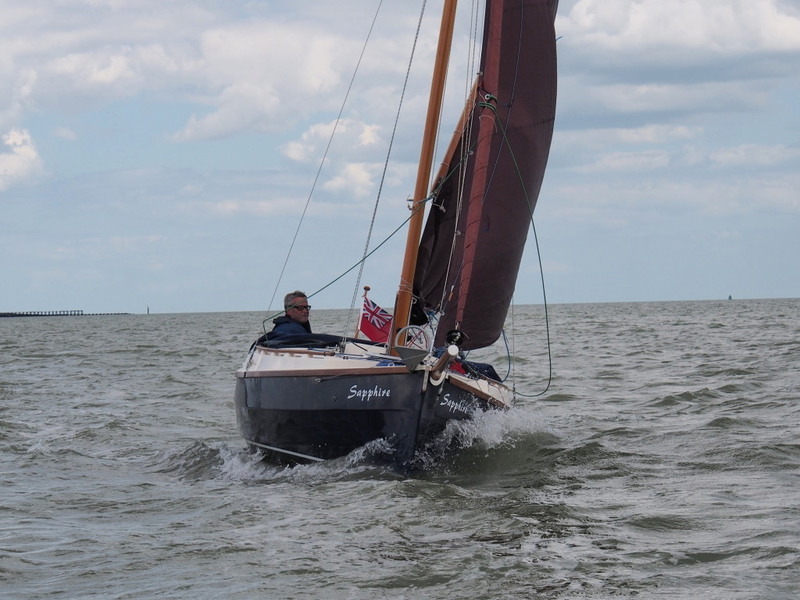 Mark is a regular in the race and sails on the same yacht each year. 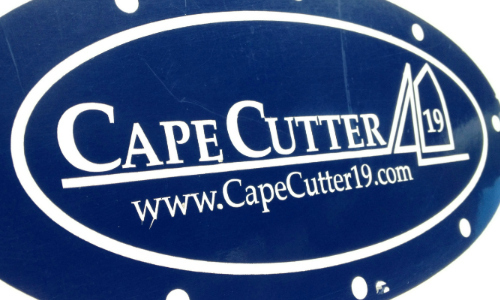 I watched their progress last year, and also monitored the “small gaffer” class, which included several Shrimpers but sadly no Cape Cutters. 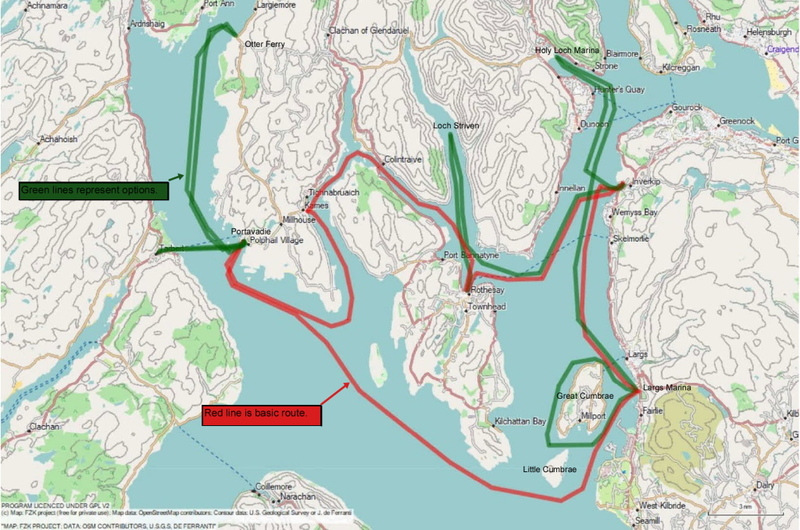 The plan in outline is to sail from Portland to the Solent arriving a few days before the race. 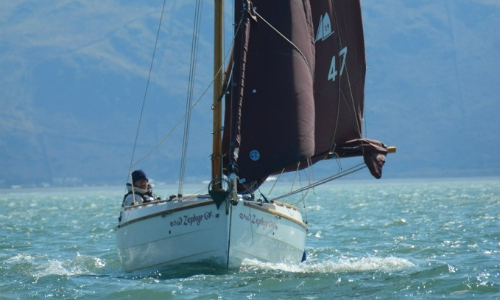 Unload a couple of hundred Kilos of cruising junk, join up with a crew who ideally knows the course and how to race , complete the race , celebrate , load up and continue along the South Coast.I will need to borrow a Genoa for the broad reach and downwind legs. Sails. We missed not having a genoa, although the Yankee is great for visibility and handleability. 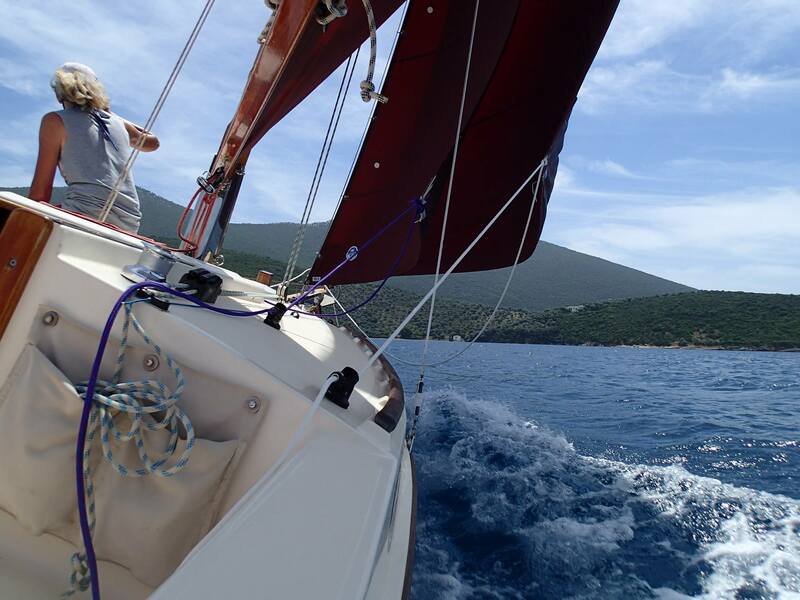 Ideal in conjunction with the stay sail for upwind sailing. Lacks grunt when off the beam and running. I guess the racers would go for a gennaker, but cost rules one out for me. Charts Pilots etc. I carry Imray Charts, ideal for passage planning and include a series of thumbnail chartlets for harbours etc. I have a Standard Horizon Chart plotter, shows tidal streams and excellent detail of harbour entrances. I have a radio with built in AIS. When in busy shipping areas the AIS , which displays on the radio and the chart plotter shows shipping , including the vessels name , course , speed , MMSI code and projects the nearest point of contact . Pilot books, Reeds Nautical Almanac, Tidal Atlas. Engine / Fuel. The engine is a twin cylinder Honda, heavy but relatively quiet. The remote tank holds 15 litres of petrol. I carry three 5 litre cans, as back up. Probably enough fuel to motor over 100 miles, even in adverse conditions. Safety. A 2.4 metre inflatable with a rigid inflatable floor. 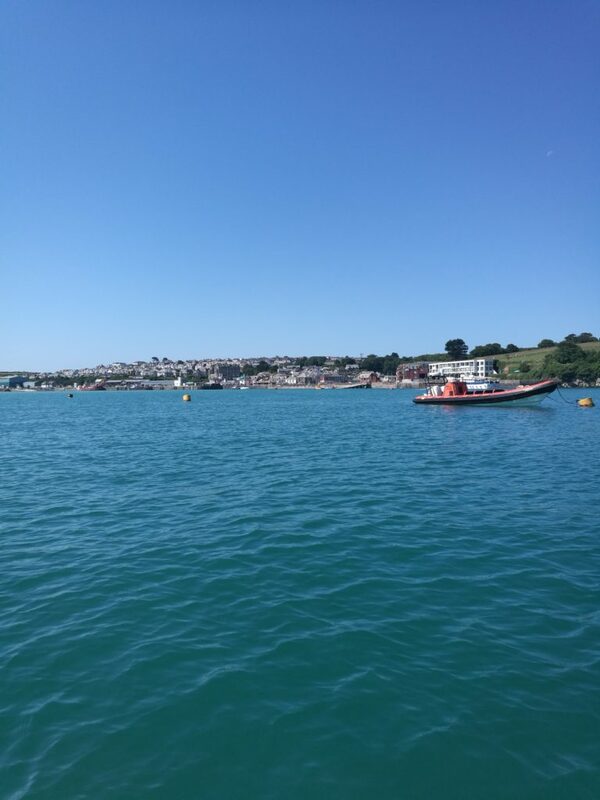 A two man , self-inflating Seago safety raft , 2 PLBs ,offshore lifebelts with built in harness , hoods and lights , 2 hand held VHF radios , safety lines for clipping on, high powered torches and mobile phones. Anchors. I carry the standard anchor plus a folding Fortress kedge anchor. Comfort. Hood, essential for overnight legs. Tent, essential to keep dry below .i.e. Wet gear stays on deck under the tent. Fridge/cool box, and Stugeron for the first couple of days. Plenty of tea and ginger biscuits for moral and sustenance. Not forgetting tokens for the obligatory pub lunches when in port.